An exclusive photo from the upcoming season of Game of Thrones shows Daenerys Targaryen making her long-awaited return to her homeland of Westeros as she makes a play for the Iron Throne. All her life, Daenerys Targaryen has heard stories of the glory days of her house, when Targaryen was the name of those who reigned over the Seven Kingdoms. But after Robert Baratheon’s Rebellion, and the fall of the mad king Aerys II, the last remaining Targaryens, Viserys and Daenerys fled Westeros and lived in exile. Viserys was killed by Khal Drogo back in the first season of Game of Thrones, but Dany has been rising in power and influence as she made her way through Essos, raising three dragons, fleeing slaves, and amassing an army of formidable Unsullied warriors to rival any force from the great houses. She has earned many titles including Khaleesi and Mother of Dragons. The last season concluded with her setting sail for the Seven Kingdoms. After the years in exile, the queen is finally ready to return and reclaim her throne and the ancestral seat of House Targaryen, Dragonstone (vacated by the late Stannis Baratheon.) TIME has released a photo of this historic event, showing Daenerys (Emilia Clarke) accompanied by her allies, Missandei (Nathalie Emmanuel), Varys (Conleth Hill), and Tyrion Lannister (Peter Dinklage.) 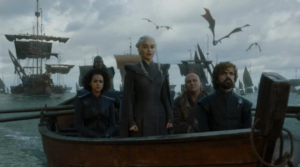 Her three dragons (Drogon, Rhaegal and Viserion) and a fleet of ships can be seen in the background. Dany’s return to Westeros has already been teased in the earlier promo for Game of Thrones season 7 as well as in the trailer for the upcoming season. Her arrival adds one more pivotal player to the struggle for power. And with the looming threat of the White Walkers about to wreak havoc on the world, Dany and her dragons might be the only hope for the survival of Westeros. Game of Thrones season 7 will premiere on July 16 on HBO.